E. and S. know me well, even if it has been a decade since we lived in the same place, so of course they offered up a bike ride this morning, first by the post office so I could run an errand–my favorite sort of bike ride–and then to the town’s bike trail. In this town, the bike trail skirts the Pacific ocean, and at the risk of sounding melodramatic, it took my breath away. I know, my breath seems pretty easy to take, but c’mon, we’re talking about Yosemite and the Pacific here. It is all just spectacular. We pedaled along, smelling the ocean air and dodging the gaps and holes in asphalt that gets routinely washed out, saying our good mornings to other walkers, joggers, cyclists, and guys with fishing poles heading down the beach. I could get used to this breathtaking business, for sure, but then it was time to turn around and head home, promises of more rides tomorrow. 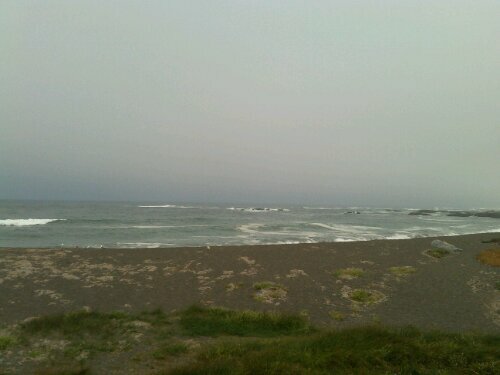 It is all fog and cool breezes out here, and I wish I had my Surly with me to do some of Highway 1. Patience, patience, try to enjoy what’s here now and not just what you wish could be, I thought to myself as the ride ended too soon–a helpful reminder in general, I think. This entry was posted in nature, parks, personal and tagged bike trails, Fort Bragg, Pacific Coast Bike Trail, Pacific Ocean. Bookmark the permalink.